Private, Picturesque, Perfect. Castle Stone with beautiful elevated vista views of the North Tyger River, have been planned to provide privacy and tranquility for your custom designed home. The successful blending of individual home sites with the splendor of the surrounding area, creates a cohesive community with an exciting future. A limited number of river access lots are available. $480,000.00 in instant equity! 23 fully developed, high end single family residential, river front (not flood plane!) building lots. 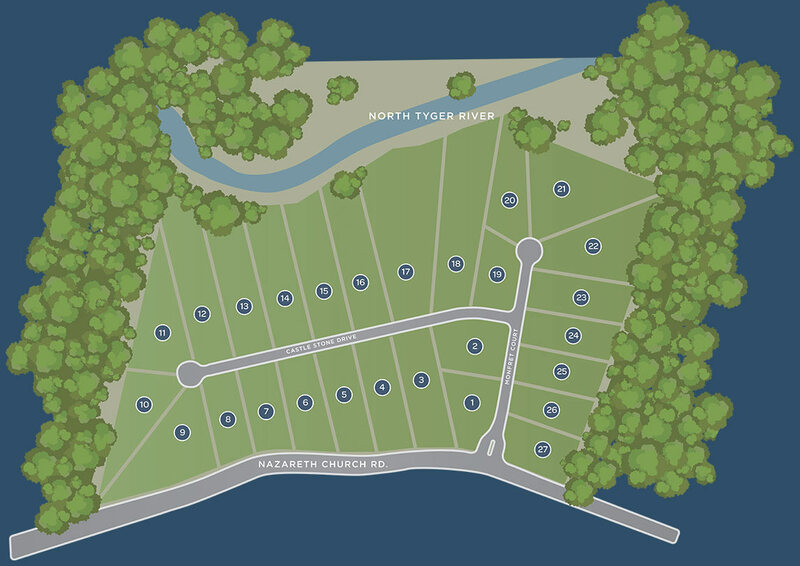 These lots are in a beautiful, stone & wrought iron gated subdivision, are zoned for the most desirable Spartanburg district 6 schools, are completely shovel ready (one home with a CO, and a second home under construction now! ), and most are over an acre in size. In addition to being in District 6 School Zone, Spartanburg Community College, Wofford College and University of South Carolina Upstate are nearby. The value represented here as individual lots is almost two million dollars – $1,860,000 – However, if purchased together can be bought for $1,380,000. This bulk price is firm, but Owner will consider sales of individual lots.